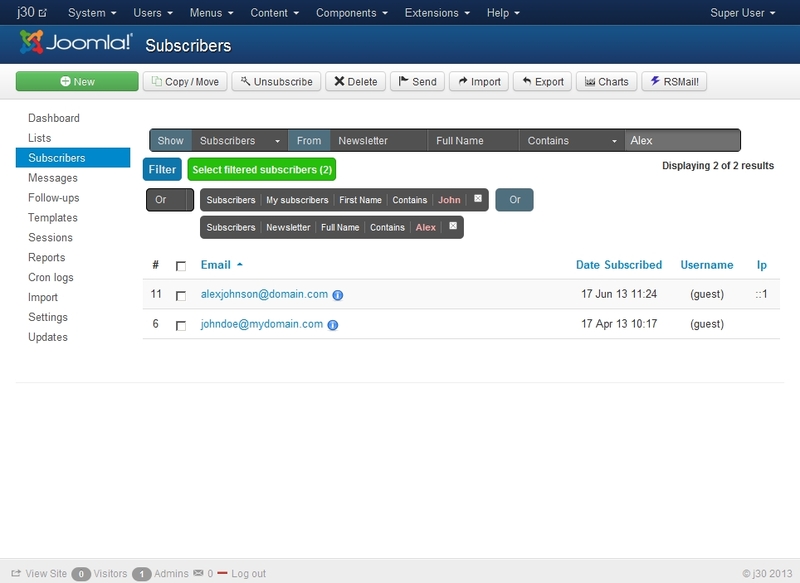 The Subscribers tab offers a general and a list-categorized view of your current subscribers with advanced filtering options. 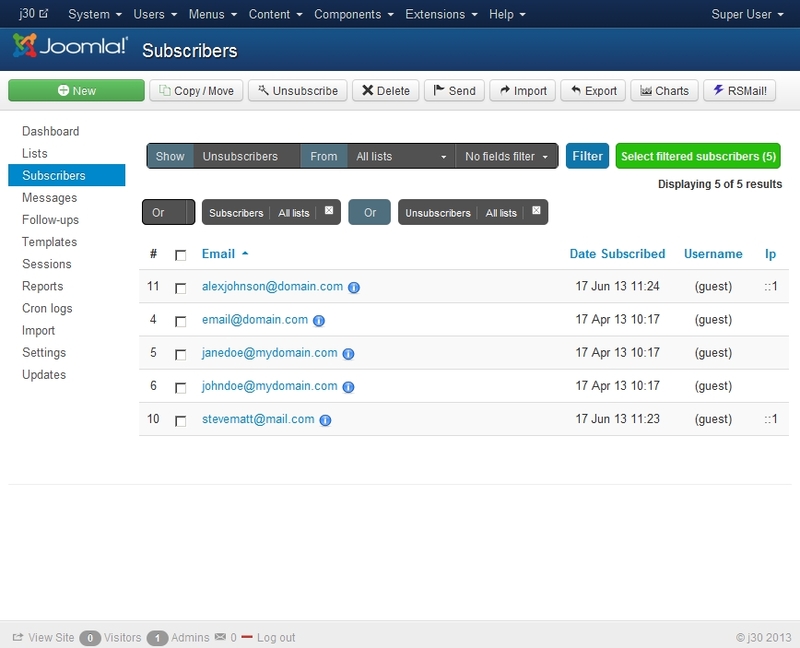 New subscribers can be manually added, imported from a CSV file, subscribed via the RSMail! 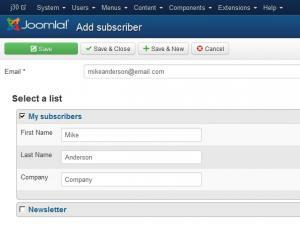 module, via a RSform!Pro form or directly by filling in the default Joomla Registration form. 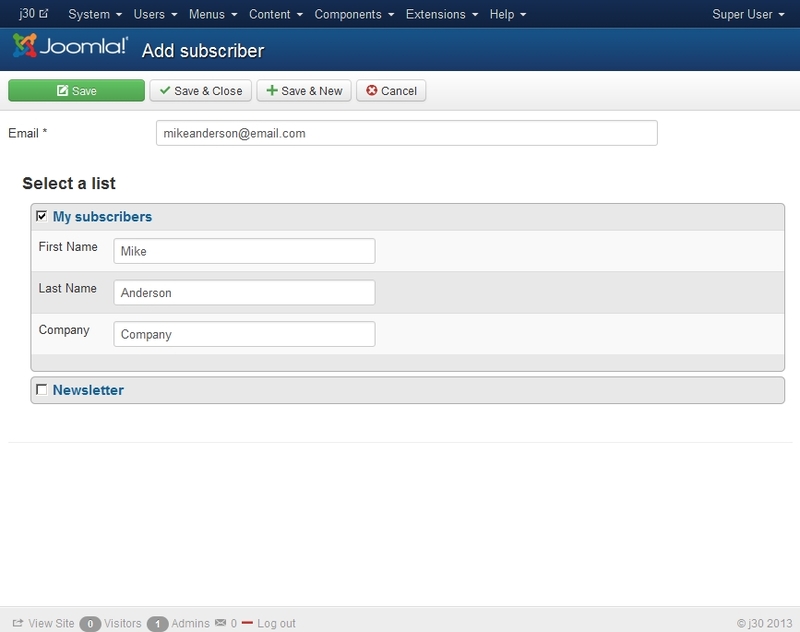 select the list that you wish to add it (you can then copy the subscriber to other lists) and click Apply. upon applying the data the lists additional information will appear to be filled (if necessary). 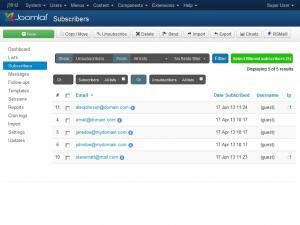 When manually adding/editing a subscriber you can assign it to multiple newsletter lists. Just select the list and type in the list specific information. click Import. Depending on the CSV file this may take up to a few minutes. The Subscribers view also offers a simple CSV Exporting feature - just click on the Export and all the subscribers contained in that list will be exported. Logic operators ("And" , "Or") are used for a more strict filtering method using multiple criteria. "And" is more restrictive, used to search for results that meet all the selected filters at once, "Or" will display subscribers that meet any of the selected filters. 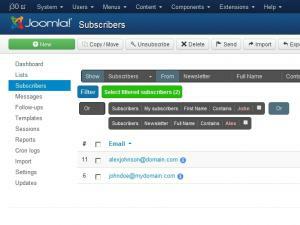 You can filter anything with any condition from unsubscribers, subscribers, field that contains/or does not contain certain information. The "Select Filtered Subscribers" button is useful for selecting all the results (including the ones that will not show in the first page). 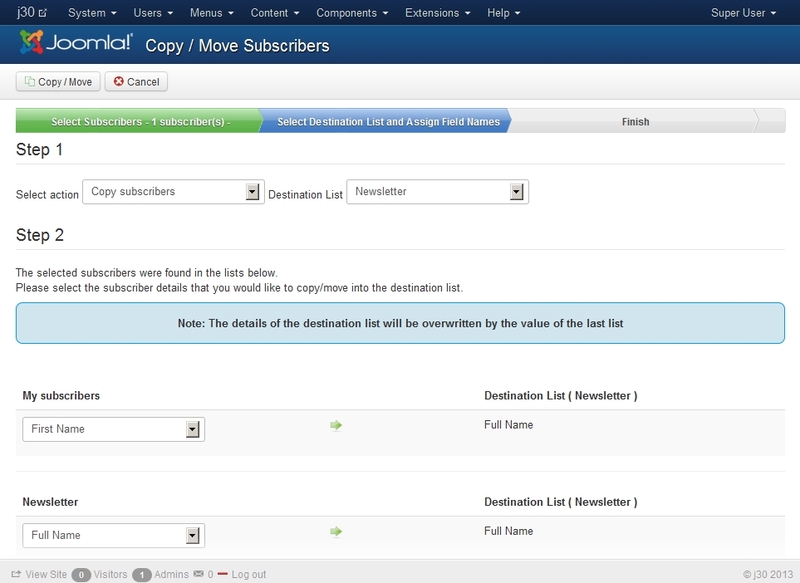 Upon filtering, select your subscribers then press the Copy/Move button. Select copy or move then the destination list. Map the fields that you want to move or copy then click the Save button. Deleting subscriber(s), after selecting subscriber(s) press the Delete button, you can then choose which list(s) you want him/them removed from. By default will automatically select the list(s) that is/are part of. 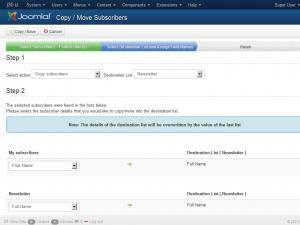 Select subscriber(s) then press the Send button. Select the message you want to be sent(you can also use a message template), then press the Send button. You can send the message immediately or scheduled by using a cron job. When you're done press the Send button again.